All vehicles roll over. Due to their higher center of gravity and narrow wheel base, Sport Utility Vehicles (SUVs) roll over more than passenger cars. In rollovers, the biggest risk of injury to passengers is from ejection. Seat belts alone do not protect passengers in rollovers for a number of reasons: buckles frequently unlatch or fail, slack is created in the restraint system that permits passengers to be literally pulled out of their seats by the forces in a rollover, or the passenger is still partially ejected out of the windows because the restraints do not keep passengers in their seats. If the seat belt system does its job, there is still another risk in a rollover. The roof structures of many SUVs are so poorly reinforced that the roof literally crushes the passengers where they sit. For many years, automakers have argued that people are not injured by roof crush and there was no relationship between roof strength and risk of injury. Automakers have presented the incredible argument that people are injured when they "dive" into the roof during a rollover event before the roof crush. However, a recent study shows that the strength of a vehicle's roof has a significant effect on the likelihood of death or serious injury to its occupants. The independent study by the Insurance Institute for Highway Safety (IIHS) looked at the roof strength of 11 midsize SUVs and data from almost 23,000 rollover crashes of those vehicles. 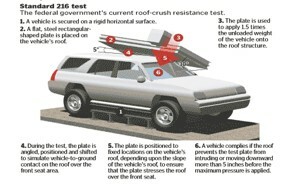 Based on these findings, it was estimated that by making the roofs on every SUV as strong as the strongest roof it tested, it would prevented 212 of the estimated 668 deaths involving those vehicles in 2006. The IIHS study also indicates that the National Highway Traffic Safety Administration (NHTSA) underestimated the number of lives that would be saved by raising its standard for roof strength. NHTSA has issued a supplemental notice of proposed rule-making (SNPRM) seeking public comment on a proposed roof strength standard earlier in 2008 with the comment period closing in March (73 Fed.Reg. 5484, January 20, 2008). NHTSA, which is federal agency whose director is appointed by the President, currently has a standard (FMVSS 216) which has been in effect since 1971 which requires a vehicle's roof to support a force of 1.5 times a vehicle's weight. NHTSA has proposed raising the standard to 2.5 times a vehicle's weight, a move that has been vigorously opposed by the lobbying arms of the automakers. The IIHS study stated that many more lives could be saved than the estimated lives NHTSA first asserted could be saved by increasing the standard to beyond the 2.5 proposed by NHTSA. This is not the first independent study that shows a relationship between roof crush and injury. Despite these independent studies, automakers still argue that it is was not the roof crush that causes the injury. However, when the roof collapses in on the occupant compartment leaving no room for a passenger, it is hard to argue that it was not the failed roof that killed or crippled the passengers. 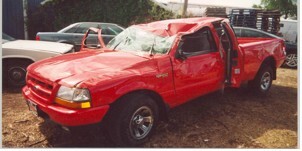 The crashworthiness doctrine of products liability law requires automakers to protect passengers from the effects of a second collision (when the roof collapses and crushes the necks of the passengers). Since the only thing automakers respond to is the bottom line, when their pocket books are drained from more and more jury verdicts, only then will they listen. George Bellas has handled a number of cases involving roof crush in SUVs and has the experience to assist you or a family member who has been injured in an SUV rollover.